This ultraviolet view of Mars was created using images from NASA's MAVEN spacecraft taken between July 9-10, 2016 using the probe's Imaging UltraViolet Spectrograph. NASA released the images on Oct. 17, 2016. The first detailed look at Martian "nightglow" has been revealed, thanks to the work of NASA's newest Red Planet orbiter. The space agency's Mars Atmosphere and Volatile Evolution (MAVEN) probe took global pictures of the Red Planet in ultraviolet (UV) light, revealing how winds flow at high altitudes. You can see a video of the UV nightglow on Mars here. This ultraviolet image near Mars’ South Pole was taken by MAVEN on July 10 2016 and shows the atmosphere and surface during southern spring. The ultraviolet colors of the planet have been rendered in false color, to show what we would see with ultraviolet-sensitive eyes. Darker regions show the planet's rocky surface and brighter regions are due to clouds, dust and haze. The white region centered on the pole is frozen carbon dioxide (dry ice) on the surface. Pockets of ice are left inside craters as the polar cap recedes in the spring, giving its edge a rough appearance. High concentrations of atmospheric ozone appear magenta in color, and the wavy edge of the enhanced ozone region highlights wind patterns around the pole. These emissions are produced when UV light from the sun breaks down carbon dioxide and nitrogen molecules on the day side of Mars. High-altitude winds circulate the remaining atoms across the planet. On the Martian night side, the atoms flow down to lower altitudes, where nitrogen and oxygen atoms combine and create nitric oxide. The resulting energy the combination creates is released as UV light. While nightglow has been detected by earlier missions, MAVEN is the first to show images of it in action. "Splotches and streaks appearing in these images occur where [nitrogen oxide] recombination is enhanced by winds. Such concentrations are clear evidence of strong irregularities in Mars' high-altitude winds and circulation patterns," NASA officials said in a statement. This image of the Mars night side shows ultraviolet emission from nitric oxide (abbreviated NO). The emission is shown in false color with black as low values, green as medium, and white as high. These emissions track the recombination of atomic nitrogen and oxygen produced on the dayside, and reveal the circulation patterns of the atmosphere. The splotches, streaks and other irregularities in the image are indications that atmospheric patterns are extremely variable on Mars' nightside. The inset shows the viewing geometry on the planet. MAVEN's Imaging UltraViolet Spectrograph obtained this image of Mars on May 4, 2016 during late winter in Mars Southern Hemisphere. "These winds control how Mars' atmosphere responds to its very strong seasonal cycles," they added. "These first images will lead to an improved determination of the circulation patterns that control the behavior of the atmosphere from approximately 37 to 62 miles (about 60 to 100 kilometers) high." 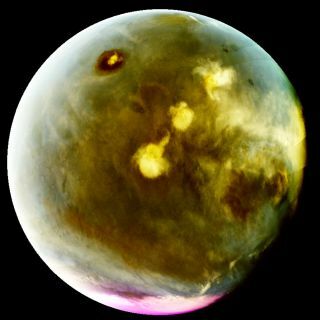 Besides showing nightglow, MAVEN's new UV images reveal how ozone changes seasonally, and that clouds are formed over huge Martian volcanoes, mission team members said. MAVEN's Imaging UltraViolet Spectrograph obtained these images of rapid cloud formation on Mars on July 9-10, 2016. The ultraviolet colors of the planet have been rendered in false color, to show what we would see with ultraviolet-sensitive eyes. Daylight images of the Martian south pole were obtained, showing that ozone persists longer in the southern hemisphere than previously believed. While ozone breaks down when water vapor is introduced, the global winds of Mars keep the water vapor away well into the spring. MAVEN's images of clouds over four Martian volcanoes are some of the best a mission has taken, NASA officials added. Monitoring clouds helps scientists understand how a planet regulates its energy and water vapor over each day and season. These results will be presented tomorrow (Oct. 19) at the American Astronomical Society Division for Planetary Sciences meeting in Pasadena, California, by Nick Schneider, an associate professor at the Laboratory for Atmospheric and Space Physics at the University of Colorado.